I recently attended the Accessories Council holiday preview at The Manhattan House, hosted by Accessories Council President, Karen Giberson and special guest co-host, Lilliana Vazquez, founder and creative director of CheapChicas.com. Both Karen and Lilliana showcased the Accessories Council's top gift picks from sunglasses and scarves to jewelry and tech items. 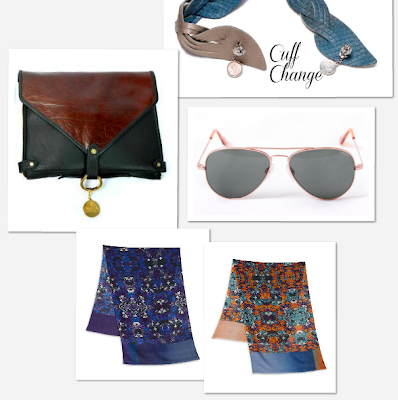 A unique and versatile gift this season is Leigh Ann Barnes Cuff Change reversible leather cuff bracelet with good fortune penny charm and cufflink. The Cuff Change is a valuable accessory and life-changing project - an American Made line of leather cuff bracelets handcrafted by survivors of domestic violence. There are two ways to wear it - French style - "kissing cuff" with ends pinched together or "Barrel style" with one end overlapping the other. You can personalize it with your own cufflink or raid your dad's or grandpa's cufflink collections. This super-soft leather cuff even stays put on my tiny wrist! Leigh Ann Barnes is also known for her handbags, including the Attache ($365) 6-in-1 convertible - a two-sided attache that features embossed snakeskin on one side and brown and black leather on the opposite side. It easily converts from a handbag to an envelope clutch or crossbody. Since rose gold is so on trend this year, Randolph Engineering Concord Rose Gold Sunglasses ($169) are the perfect gift for anyone that loves rose gold. This classic style, re-engineered and hand-crafted using military standards, will last a lifetime of wear and tear. It also has adjustable silicon nose pads for a customized fit and comes with a case, microfiber cleaning cloth and small maintenance kit. The perfect way to accessorize, update and layer your look is with Bindya New York scarves. Bindya scarves are made of cashmere and silk and are available at Saks Fifth Avenue, Bloomingdale's and Nordstrom. One of my favorite bold prints is the Ms. Pacman in Purple ($150) Multi. 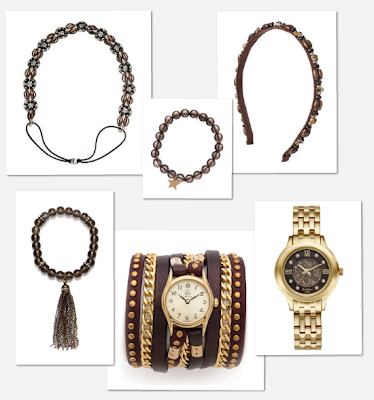 Evita Peroni features luxurious fashion accessories including headbands, jewelry, and sunglasses. My top picks include the Kaylee Soft Band ($103), Karina Hair Band ($88) and Tabitha 3 Bracelet ($58), which can also be shipped ready-to-go in a beautiful gift box. Holy Bauble jewelry is influenced by vintage and antique religious medals from all different faiths and beliefs, promoting peace, unity and good works. With tassels being a popular trend this year, the Count Your Blessings Bracelet ($40) is a beautiful gift item. At the top of my watch list are watches from Sara Designs, like this Studded Leather Wrap Watch ($196). I love the adjustable length and detailing on the watches, from chain to braiding detailing. Sara Designs watches are available at shopbop, Bloomingdale's, Free People and Swell. The Armitron Swarovski Crystal Accented Gold Tone Watch ($80) easily dresses up your wrist. It's gorgeous, yet incredibly affordable. 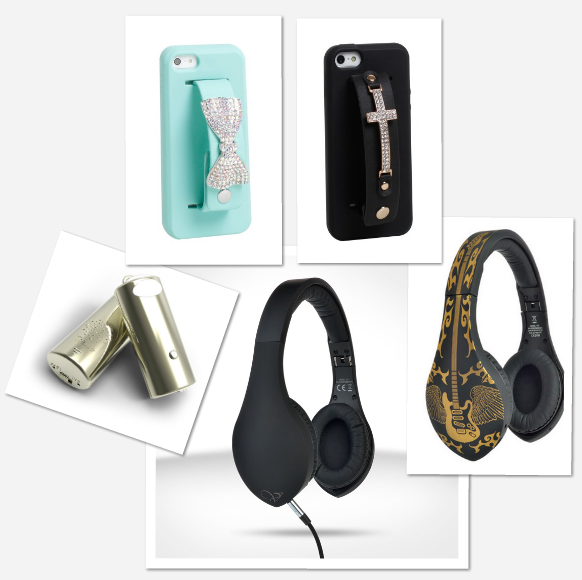 One tech accessory that iPhone 5 users will be excited about are David and Young faux leather style strap phone cases, such as Bow Dazzle ($20) and Gothic Glam ($20), both with rhinestone detailing. This fashionable accessory allows me to hold onto my phone when I don't have any pockets or when I am carrying too many things. It makes the perfect stocking stuffer and comes in a variety of styles and colors, with python, rhinestone, hinged links or nailhead detailing. Trellie ($49.99), available in silver or gold, is designed to attach to the outside of your handbag, makes sure you never miss an important call. Trellie lights up when you get an incoming call and continues to flash when you miss a call. Whether you are in an important meeting or out to dinner, you can keep your phone in your bag and avoid any phone distractions. Velodyne vLeve On-Ear Headphones ($219) are a stylish choice, providing great sound quality and a collapsible design for on-the-go storage. Available in black or silver, you also have the option to switch up the look of your headphones with Designer Skins ($39.99) such as Guitar Tattoo (Black), Black Tattoo or Cubist Guitar.